Nasa has said that its Juno spacecraft, launched five years ago, will get closer to the cloud tops of Jupiter this Saturday than at any other time during its prime mission. “This is the first time we will be close to Jupiter since we entered orbit on July 4,” said Scott Bolton, Principal Investigator of Juno from Southwest Research Institute in San Antonio. At the moment of closest approach, Juno will be about 4,200 kilometres above Jupiter’s swirling clouds and traveling at 208,000 kilometres per hour with respect to the planet. 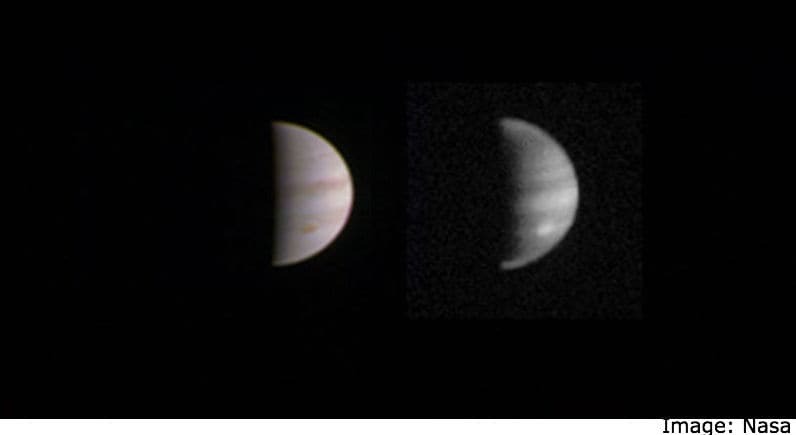 There are 35 more close flybys of Jupiter scheduled during its prime mission scheduled to end in February of 2018. The flyby on Saturday will be the first time Juno will have its entire suite of science instruments activated and looking at the giant planet as the spacecraft zooms past. “So for this upcoming flyby Juno’s eyes and ears, our science instruments, will all be open,” Bolton noted. “This is our first opportunity to really take a close-up look at the king of our solar system and begin to figure out how he works,” Bolton said. While the science data from the pass should be downlinked to Earth within days, interpretation and first results are not expected for some time, Nasa said. “No other spacecraft has ever orbited Jupiter this closely, or over the poles in this fashion,” Steve Levin, Juno Project Scientist from Nasa’s Jet Propulsion Laboratory in Pasadena, California, said. “This is our first opportunity and there are bound to be surprises,” Levin noted. Not only will Juno’s suite of eight science instruments be on, the spacecraft’s visible light imager — JunoCam will also be snapping some closeups. A handful of JunoCam images, including the highest resolution imagery of the Jovian atmosphere and the first glimpse of Jupiter’s north and south poles, are expected to be released during the later part of next week, the US space agency said. The Juno spacecraft was launched on August 5 2011, from Cape Canaveral, Florida.